Under the theme “ICTs for Inclusive Growth”, The Global Information Technology Report 2015 showcases solutions to allow everyone to benefit from and participate in the ICT revolution and to contribute to a more prosperous and inclusive world. Below are 3 key messages. As a general-purpose technology, the impact of ICTs extends well beyond productivity gains. ICTs are vectors of economic and social transformation. By improving access to services, enhancing connectivity, creating business and employment opportunities, and changing the ways people communicate, interact, and engage among themselves and with their governments, ICTs can transform our world. Yet only widespread and systematic usage of ICTs by all stakeholders—individuals, businesses, and government—can trigger such transformation. 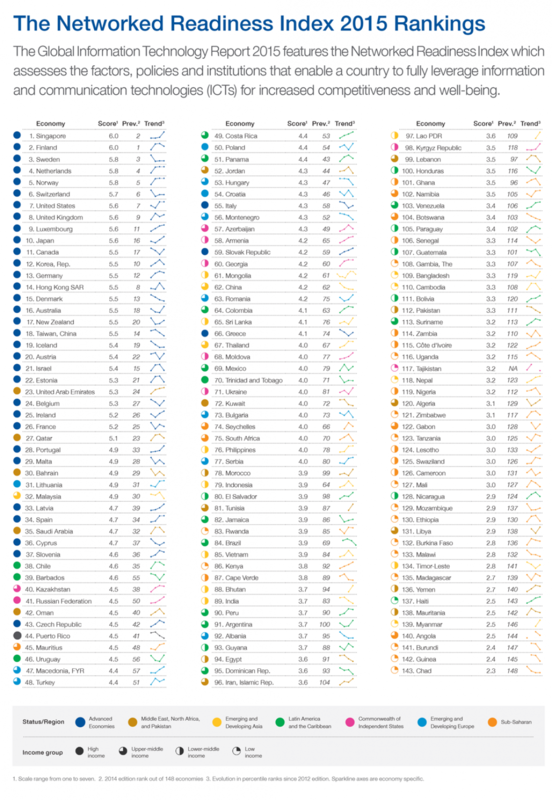 The Networked Readiness Index (NRI) reveals the almost perfect correlation between a country’s level of ICT uptake and the economic and social impacts ICTs have on its economy and society. ICTs are neither as ubiquitous nor spreading as fast as many believe. 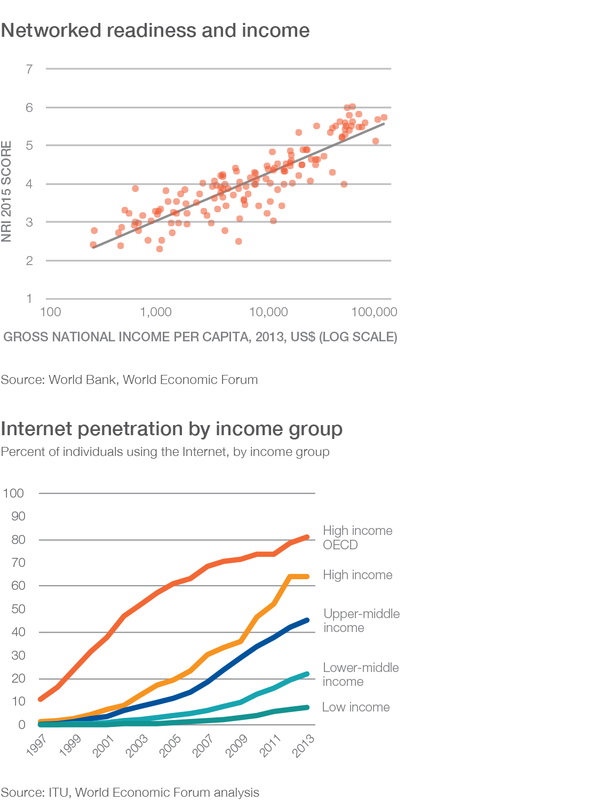 This explains in part the persistence of the digital divide across and within countries. 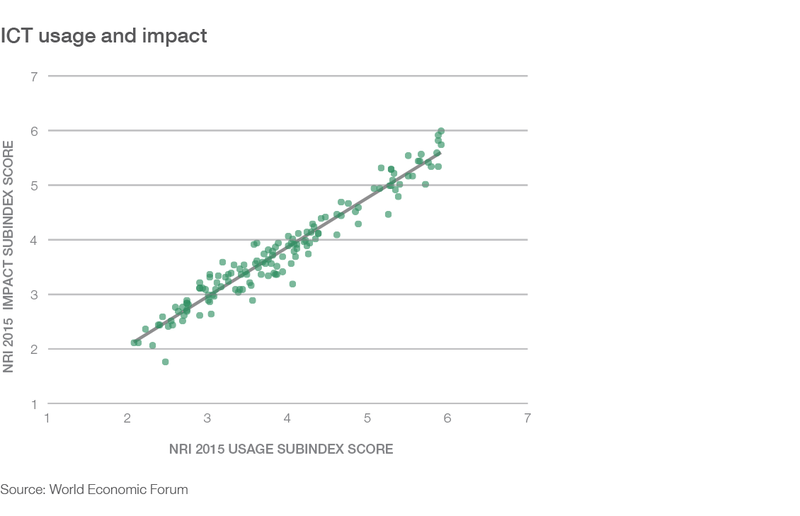 Indeed, a stubbornly high correlation between income level and performance in the NRI exists. There are as many mobile subscriptions as human beings on the planet. But half of the world’s population do not have mobile phones and 450 million people still live out of reach of a mobile signal. In developing countries, a huge divide exists between well-connected urban centers and off-the-grid rural areas. Finally, most mobile phones are of an older generation. The ICT revolution will not be carried over voice and SMS but will require universal and fast Internet. Yet some 90% of population in low-income countries and over 60% globally have never gone online. To achieve the ICT revolution and bridge digital divides, countries need to develop their ICT ecosystems. This implies long-term, costly investments in infrastructure and education. But low-hanging fruits do exist. Governments can create an enabling environment by promoting competition through sound regulation and liberalization. 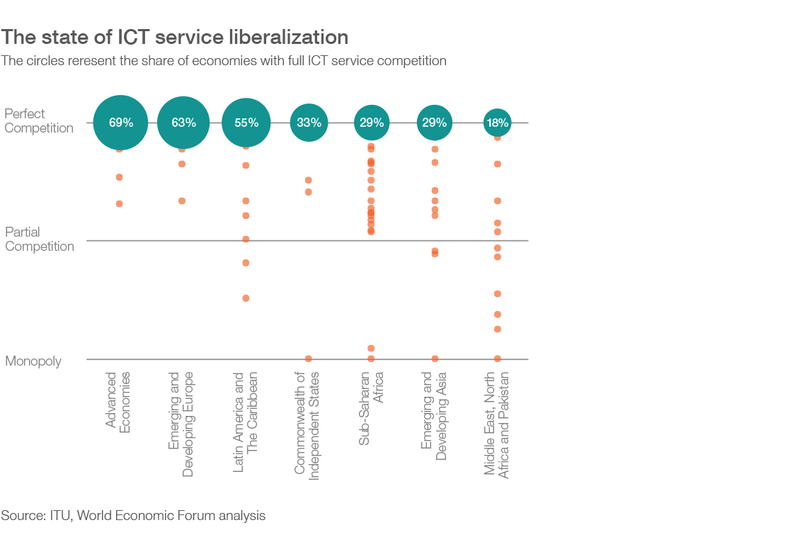 Many sub-Saharan African countries have fully liberalized their ICT markets. 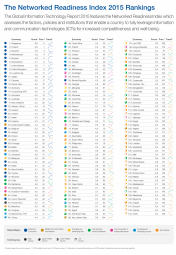 Indeed, in terms of liberalization the region is doing better on average than several others. This strategy bodes well for the future. Some countries—including Kenya and Tanzania—are already reaping the benefits of liberalization in the form of increased private investments and use and the introduction of new business models and services.